From my perspective, the biggest problem with food blogging – I mean apart from the grocery bills and grease smears on the camera and damage to my vision from staring into a computer screen until I see cross-eyed – is the shelf space required. And I’m not talking about the kitchen. Many of you already know about my shopping problem. It’s not shoes or makeup or handbags, or even little jars of fancy salts, sauces or vinegars – it’s cookbooks. Truckloads of them. In fact, I seem to have a cookbook habit that is stealthily taking over my life, not to mention every inch of available space in my apartment. According to reputable medical websites I’ve been reading, it seems I am displaying many of the classic symptoms of addiction when it comes to these books, including uncontrolled cravings, obsessive thought, overspending and paranoia. It’s getting to the point where I walk in the door at night prepared to find my friends assembled for an intervention (at which I’m perfectly prepared to admit my problem, so what’s the use of staging one?). Like everyone who finds themselves much further down the slippery slope of addiction than they ever thought they’d be, I used to assume the problem would work itself out, and for many years it pretty much did. Sure, I’ve always coveted more books than is healthy and any foray to the bookstore inevitably found me buried in the food and drink section, but practical constraints limited my purchasing power: I moved around too much, I didn’t have the money for glossy new books, and anyway I didn’t always trust myself to be able to pick out a good one from a few short minutes of browsing. But then blogging happened. Not only did I suddenly need a well-stocked library to provide fresh and exciting blog-fodder every week, but reading other blogs put on my radar an endless list of highly-praised books that I absolutely had to have. In the blink of an eye, I could justify enormous payments to amazon.com as ‘professional expenditure’, while “the blog needs it, not me” quickly became my catch-all mantra. It’s probably not coincidental that my accelerated accumulation also coincided with settling down for a few years in Scotland and for the first time finding myself with a regular income, but I know better than to blame shift. My dear blog, because of you in the past year I have begun purchasing new cookbooks at the frightening rate of nearly one per week, I have started to avert my eyes in shame every time I’m called to pick up a delivery from the secretary’s office at work, and I have learned to hide my bag behind the coat rack when I come home so Manuel doesn’t see the books sticking out. I have become unreasonable, obsessive and downright dishonest about my problem, going so far as to convince my poor husband that he’s delusional when he thinks he spies the new titles on the bookshelf. I break into a cold sweat at the thought of having to choose which books to grab on my way out in case of a fire. Yet as bad as all this may seem, it’s not the real problem. No, the real problem is that for all the time, energy and money spent feeding this addiction of mine, I hardly ever use my books for what they’re intended. In fact, a quick count of the bookshelves has just revealed that even after a year of blogging, a full three-quarters of my cookbooks have never been cracked open in the kitchen. And even when I intend to use one I somehow manage to get waylaid. Last weekend, for example, I locked myself in the kitchen with several new books, determined to tick off at least one new recipe. When I emerged two hours later, however, what emerged with me was not a stunning new creation courtesy of Pierre, Patricia or Julia, but instead a dessert I’ve been making faithfully for more than a decade. Never mind that it’s one of the most delicious cakes I’ve ever eaten, sporting a thick layer of dense, buttery sponge, fragrant with ground almonds and almond extract and cradling a smear of bracingly tart lemon curd; never mind about the scattering of crunchy almond slivers providing just the perfect amount of textural contrast to the creamy topping and tight crumb. And forget about the fact that it’s a welcome taste of sun-drenched citrusy freshness in the middle of a long, dark winter. The important (and certainly unforgivable) thing is that making it didn’t require me to so much as brush the cobwebs from one cookbook. The most embarrassing part of all, however, is what I did the instant that cake was out of the oven. I cut myself a big slice and went to the computer to look up the price of new bookshelves. Notes: I have a note that the original recipe (which I can no longer find, unfortunately) suggests that you serve this in a puddle of fresh raspberry coulis for a more formal presentation. I’ve never tried it that way but I imagine it would be both delicious and visually striking. To make the lemon curd: In a non-corrosive heavy saucepan, combine sugar, eggs, lemon juice and zest. Whisk until thoroughly blended. Add the butter. Cook over medium heat, whisking constantly for 3 to 5 minutes, or until the mixture thickens. Don’t let it boil! Transfer the curd to a bowl, cover the surface with plastic wrap and chill for at least 4 hours or overnight. To make the torta: Preheat oven to 350F/180C. Generously butter the bottom and sides of a 9-inch (27cm) round springform pan. Line the bottom of the pan with a circle of baking parchment. Gently press about half of the sliced almonds against the side of the pan, adhering them about 2/3 of the way up from the bottom. In a food processor combine the whole toasted almonds, flour, baking powder and salt. Process for 10-20 seconds, until finely chopped. In a small bowl, beat the eggs lightly with a fork until frothy. In a large bowl using a hand-held mixer at low speed, beat the butter for 30 seconds, until creamy. Gradually add sugar and continue beating for 2-3 minutes, until light in texture and almost white in color. Beat in vanilla and almond extracts. Using a rubber spatula, fold the almond/flour mixture into the butter mixture until blended (the batter will be stiff). Stir in the beaten eggs just until smooth. Scrape the batter into the prepared pan and spread it into an even layer with the back of a spoon. Spoon 8 tablespoons of the lemon curd in an evenly-spaced ring around the top of the cake batter, about a 1/2-inch in from the side of the pan. Spoon 3 tablespoons evenly spaced into the center of the ring (it will all melt together into an even layer in the oven, but if you don’t want to bother counting just dollop the curd evenly all over the top). Sprinkle the remaining sliced almonds over the top of the batter. Lightly dust with confectioners’ sugar. Bake the torta for 25-35 minutes, until a cake tester or toothpick inserted in the center comes out with a few moist crumbs clinging to it. Cool the torta completely in the pan set on a wire rack. Run a thin-bladed knife around the edge of the torta to loosen it from the side of the pan before removing. Peel off the baking paper and dust the torta with more confectioners’ sugar before serving. Eat at room temperature. Gee, I wish I could offer some clever insight into the cookbook thing. I really wish I could. But you know, something makes me feel like I’m in good company, especially when I come back to read the comments to this post.I am lucky enough to 1) have a big garage and 2) enough space in my office to store cookbooks. But this doesn’t address the need to purchase cookbooks. Do you think there’s a global support group? Ah beautiful Melissa! I am reading your post and the more I read, the more I smile ; the more I close my eyes, the more I can see "you", the total culprit with your addiction. What my husband would actually ask is "Is this new? ", and me answering "Of course not, I have had it for ages!" I suffer from the same addiction, BUT my new step is that they are all over the floor, on every possible possible corner of the house, with sticky notes indicating "things to cook".Really really loved your post! hi melissa, lovely torta! this post just about sums the condition up 😉 i have had this conversation with s of chubbyhubby – we’ve come to the conclusion that it’s not whether you use a book or even the recipes within it, it’s the assurance of knowing exactly where to look .ie.right there on your shelves come the day in the distant future when you do need to look it up! you know you’ve gone past the point of no return when everything is translated into cookbook units eg. another pair of kitten heels versus 4 new books? I discovered recently the overloaded world of food blogs.Your blog is one of the most inspired, rich and «worth reading».Thank you to be there.cl. Though I am surprisingly restrained when it comes to cookbook purchases, I am completely out of control when it comes to cakes containing almonds! And lemon curd? My dear, your palate never fails. Dear Melissa, Perhaps I should call you PARTNER IN CRIME from now on, rather than our former used term COOKBOOK AFICIONADO… because I know all the dirty tricks about smuggling new cookbooks unseen through the back door 😉 But then – there are worse addictions, no? And funnily my entire social environment seems to adapt to it – even my boss gave me cookbooks for Christmas! Ha! Most of us I guess can relate to your "problem" with cookbooks or any cooking prints (magazines! )I went through a kind of "12 steps program" 3 years ago and it’s working despite my recent cooking blog. Let’s say since we have kids, school tuitions fold 2 and in a few months fold 3, a century and a half old house to renovate… You get the picture…I’m thankfull though for the time I was like you and buying truckloads of cookbooks and magazines. I have an enormous stock to browse now that I can’t buy anymore and it makes the craving less hard to endure.So go ahead and buy while you can! Some spend the same kind of money smoking cigarettes. I prefer your kind of addiction. It was the title of this post that caught my caught my attention. Lemon?! Oh, how I love lemons!Then I saw the photo. Gorgeous!Then I read the post, sympathising completely with your cookbook addiction while being mildly reassured at the same time. "See, I’m not so far gone! Maybe I’ll celebrate by buying a cookbook." :-)Thanks for this marvellous post and delicious recipe! When I moved from New York City to Buenos Aires did I bring my furniture? Did I bring all my kitchen utensils, plates and glassware (well, some of it)? Did I bring my cookbooks? Every last one of them – 35 boxes worth! thanks for the recipe. I really need to start using mykitchenaid mixer. Its sitting on my counter top collecting dust. thanks for the inspiration. 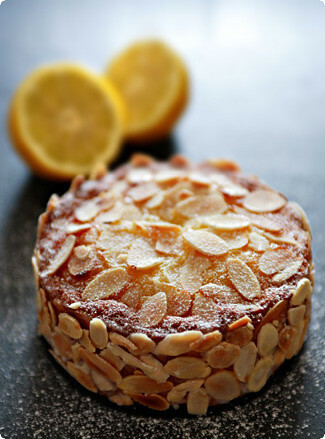 Thanks for posting a lemon and almond dessert…in my opinion there are not enough lemon desserts. I will definatley give this one a try. Don’t worry about your cookbook addiction….really it could be a lot worse. Lemons and cookbooks, I mean what could be sweeter. Reading the comments, I was hoping to discover some new tricks for concealing my purchases. Alas, no I’ve used them all. I also love lemon and must try the torta. Terrific post. I’ve recently emerged from a cookbook buying binge myself where I even ordered books from the UK Amazon site that aren’t available in the US. And one book from Spain. Yes, I am an addict. When and where is our first meeting of CAA, Cookbook Addicts Anonymous? I could use a support group (especially if you bring along some of those lemon almond tortas). I am so glad that I’m not the only one completely hooked on cookbooks, food magazines, etc…! Fortunately I have a local library that I can borrow from as well…then write down my favourite recipes from them into a notebook or store in my computer!! Lemon and almond – I can’t wait to try this and Chocolatier is one of my all time favourite magazines…drool and the photography is amazing!! That photograph is completely ridiculous! Must have some. And oh yes, I understand the problem of the bulging shelves. I try to restrain myself. I really do. But….Lovely post, my dear. As you can probably guess by all of these somments you are not alone. I too share your obsession & also share it with fiction. One thing I do is release my books into the wild through Bookcrossing – a great website if you havent heard of it. So far I have not parted with the cookboks though, only old fiction that was never that good to start with. And yes I keep buying up the books, this week I have already acquired 2 new books, one from my darling hubby who hasnt quite realised the extent of my problem & one from ebay – my firt win – can see ebay could present some future problems, its almost like hte fun of gambling, on no what have i started??? Oh I used to think you were so good and restrained (copying down recipes in your head in bookstores) and instead you are just like me!!! Hehehehe.I keep resolving to be better and actually cook from some of my collection but it just doesn’t happen. I will try harder … soon! I’m totally with you on the cookbook addiction, and just as guilty about not using them too much. Hello Melissa,Thanks so much for the recipe. I tried it last week and it was scrumptious! Melissa,Dessert and cookbooks…I don’t know why I hadn’t wandered over to your website sooner! That is one beautitful torte – the flavors sound so perfect! I agree with you that since I started blogging I have increased my rate of cookbook acquisition – and most of them are on my bedroom floor! I made your lemon almond torta…delicious. The only problem I had was making the sliced almonds stick to the side of the pan. Any tips? Melissa,First let me say what an inspiring site! Your descriptions and anecdotes for each recipe is detailed to perfection.Being another recipe "buff" as my husband (& indeed all my family) calls me, rest assured, you are not alone. I collect cookery books, mags, newspaper cutouts and anything from the net with a fiery ambition on a task I have to accomplish each day. So, like you, I am inundated with the stuff all over. Even at my workplace, it’s getting me down but that’s the only world I know and love and enjoy and will always savour.Another issue, the salt one. Yes, in Indian cooking we do temper our food, fruit and drinks (sherbets) with a pinch of salt and rock salt is more widely used than the commercial brands, besides even Martha Stewart always recommends using salt in all desserts to give it that little oomph! Anyway, I enjoyed your site to the fullestCarol from Mumbai, India. you are truly an artist!!! i love reading your entries, and savoring evey bit of pixel of your beautiful photographs. kudos!!!ps. i have the same addiction to cookbooks. and there is no solution. Dear Melissa, your tiny torta looks divine. Did you change the cooking time/temperature from the full sized one?I thought I had my cookbook addiction under control when I built my new house – there was just room for a 36" 3 shelf book stand which would restrict me to essentials. Ten years later it had expanded to floor to ceiling shelves along a 14 foot wall in one bedroom. A couple of months ago the whole shebang peeled off the wall, warping industrial brackets and leaving an avalanche of books filling the floor.It really is time to pare down to essentials! I made this dessert with a blackberry coulis for Easter last night… 18 individual cakes, doubled your recipe. Worked brilliantly… Everyone loved it. Love your blog, keep up the good work! Oh dear. I'm afraid I have the same problem. Lately though, I've been checking out cookbooks from the library and copying pages I like. If there are lots of them, then I'll buy the book for my own library. And this cake is just heavenly. Can't wait to make it. Melissa, I just came across your blog a few days ago. This is the first of your recipes I've tried. I've got my torta in the oven. A neighbor just walked in to borrow a water urn and said, "It smells amazing in here. Like something very sophisticated." I hope if, back in 2006, this post was you settling for something tried and true, that it gives you some pleasure to know that you inspired this bored baker to get excited again about making something new. Thanks, Melissa! Good to know I am not alone, currently looking for a new bookshelf for the LIBRARY also! This sounds delicious! I'll have to try it. As for the cookbook addiction…maybe you could try cooking through every recipe in all of your cookbooks before buying any new ones? It might hinder your buying process, and it might be a fun project! For a while I've been totally craving for almonds and lemon. I shall try this, perhaps tomorrow! It looks soooo delicious! By the way, I also have a thing for cookbooks. Someone already asked how I can have so many, even though I think I have less than 20… still quite a lot I guess. Found this on pinterest and just had to try it! I made it for my craft group a few weeks ago and they were very impressed. It was delicious! the only problem I had was that I used all the curd and it made the torta too heavy and hard to keep from collapsing when a piece was cut. If you use the 8 tablespoon suggested you'll be throwing out about half the curd and I just didnt want to waste it. Also my torta did not raise as much as the one from your picture.Thanks! Love your blog and can totally relate to all the cookbooks (Not to mention binders full of recipes I've printed or torn out of magazines over the years – it's crazy) ! The picture on Pinterest compelled me to try making this. The word my husband used to describe…"sublime". Turned out perfect, I did have to cook it almos an hour before it set. Thanks for a great recipe. Hi, Thanks for letting me feel not so alone in the cookbook collecting dept. I have collected many and have not got the room for all, but one day… Anyway, I am thinking the Torta is wonderful sounding, and I am going to give it a try, hoping to use it as tea cakes for my brothers wedding. Wish me luck. I too have a cookbook addiction, I think at last count I had close to 300 it might be more now. I just cant get enough. I would almost rather read a cookbook than a novel. I take them with me to restaurants (if you think that doesn't get some strange looks…) I want to buy a tablet so I can have them with me where ever I go. My latest foray into cookbooks is juicing books, not strictly cooking but still has info and recipes. I like cookbooks with lots of pictures mostly unless they are really well written with lots of extraneous info and ways to use the recipe and what it goes well with.I am saving this recipe, we love all things lemon here, even fresh pressed green juices with lemon YUUMM!